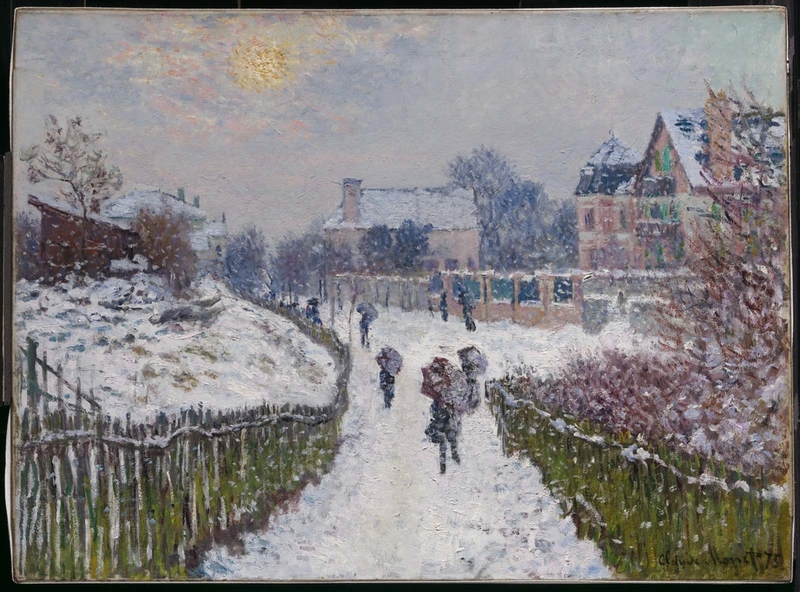 The Impressionist interest in specific effects of light and weather is evident in Monet’s rendering of the exact moment in which the sun struggles to break through a light snowfall. He made a preparatory sketch for this painting; clearly, careful deliberation lay behind his seemingly spontaneous technique. The subject of falling snow and the figures with umbrellas are reminiscent of Japanese woodblock prints, which had a strong influence on Impressionist artists. According to notes in the MFA curatorial file, Kapferer might have acquired this directly from the artist. The provenance information given here (between 1888 and 1890) is taken from Daniel Wildenstein, "Monet: catalogue raisonné" (1996), vol. 2, p. 148, cat. no. 357a. She first lent this painting to the MFA in 1920.